German academics best known for publishing collections of folk tales and fairy tales, which became popular. 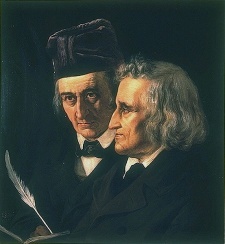 Jacob also did academic work in linguistics, related to how the sounds in words shift over time (Grimm's law), and together they wrote a German dictionary. They are among the best-known story tellers of folk tales from Europe, and their work popularized such tales as Rumpelstiltskin, Snow White, Sleeping Beauty, Rapunzel, Cinderella, Hansel and Gretel, & "The Frog Prince"